Fast and simple CD/DVD authoring software. Is there a better alternative to Burnz? Is Burnz really the best app in Backup category? 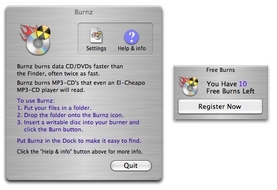 Will Burnz work good on macOS 10.13.4? 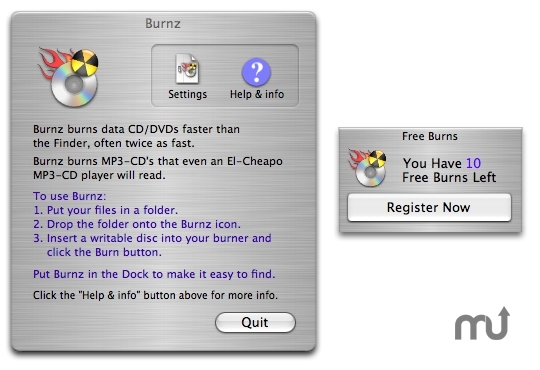 Burnz is a drag-and-drop disc-burning application that burns data discs at least twice as fast as the Finder on most Macs -- up to 10 times faster according to Thinkertons. Updates Burnz to newer version of internal utility library. Burnz needs a rating. Be the first to rate this app and get the discussion started!